Tankless water heaters are becoming more and more popular with homeowners. There are a lot of great features and benefits of a tankless water heater, but it’s not always the right option for every home. Could it be the right one for yours? 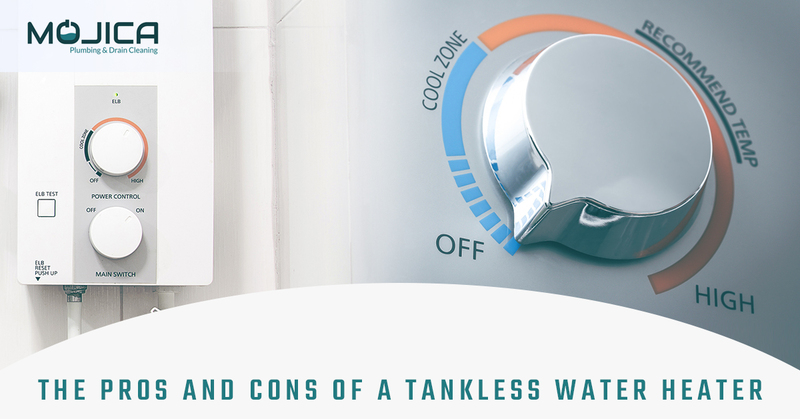 If you’ve been considering a tankless water heater, it’s important to know the pros and cons before you make a purchase. Our plumbers in Austin have installed tankless water heaters for many of our clients and we understand what makes these systems so great, as well as some of the potential drawbacks. We’ve put together this pros and cons list to help you decide if it’s time to go tankless in your home! Tankless water heaters are more efficient. Because you only end up heating the water that you are actually using, you aren’t using energy to heat water that you don’t need. Less wasted energy is better for the environment. They can save you money. Because of the efficiency of tankless water heaters, you could end up using less energy to heat the same amount of hot water. That means you are paying for less energy and could see a reduction in your monthly energy bills. The Department of Energy estimates that the average household can save more than $100 a year on their energy bills by making the switch. They use less space. Without that big, bulky tank taking up space, you could gain back area in your basement or utility closet for storage (and we can all use more of that!). You won’t run out of hot water. If you have a small water heater that routinely runs empty, you know the inconvenience of waiting for it to fill back up. A tankless water heater won’t ever “run out” of hot water. They can increase the value of your home. Homes with tankless water heaters can be more attractive to prospective buyers. That means if you are thinking about selling your home in the next couple years, going tankless could pay off when it comes to the asking price. It’s even more attractive if there is still a warranty on the unit. Tankless units have a life expectancy that’s twice that of a traditional water heater. So while they might cost more up front, you won’t have to replace them nearly as often. Most will last at least 20 years, meaning there is a good chance you’ll never have to worry about your water heater as long as you are living in that house. You could be limited to how many fixtures are using the hot water at the same time. You won’t be limited by tank size, but you could be limited by flow rate. The tankless water heater can only make so much hot water every minute, so if your demand outpaces the supply, you could end up with lukewarm water coming out of the faucet. Tankless units are typically more expensive up front. The initial cost of the unit, as well as the installation fee, could be more expensive than a traditional water heater, so you might need more money to get it set up. On average, you can expect to spend about three times the cost of a traditional water heater. Some tankless units are going to have demanding venting needs. While in most homes this isn’t an issue, it’s worth checking with a professional installer to ensure that your home can be modified to meet the venting needs. So Which is Right for Your Home? In most cases, going tankless can be a really positive choice for your home! They save you money on your energy bills, are better for the environment, and give you an endless supply of hot water when you need it. However, there are specific cases where you may want to steer clear of tankless. If you have a busy household that operates multiple hot-water-using appliances at the same time, it may be tough for a tankless unit to keep up with the demand. This is most common in households where there are a lot of people using the showers, sinks, and a dishwasher in the morning. However, if that’s the case, you might be experiencing hot water shortage with your traditional tank anyway and it’s time to explore better options. A member of our team can discuss your budget as well as your hot water usage to help determine whether or not a tankless hot water heater is the right option for you.